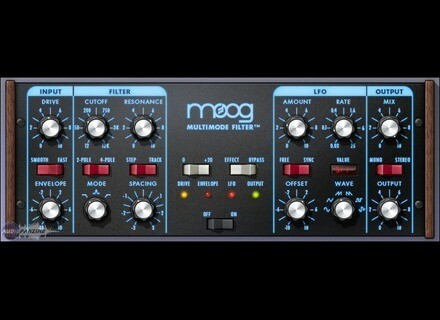 Moog Multimode Filter, Software Filter from Universal Audio in the UAD Plug-In series. loudfunk's review"A Moogerfooger as a plug-in"
Nothing bad can be said about U-Audio on any of this. If UA were able to conceive a product with Moog, what would it be? The answer is revealed in the new UAD Moog Multimode Filter, which delivers the first truly analog-sounding VCF (voltage controlled filter) emulation made for mixing, performing, creating, or destroying. The Moog Multimode Filter is a ‘digital-only’ tabletop filter set that combines the best of Bob Moog’s classic designs with select features from his final Voyager instrument. UA modeled the analog behavior of the historical 4-pole ladder filter conceived by the world’s most recognizable electronic instrument maker right down to the self-oscillation, saturation and non-linearities of its analog counterpart. As the name suggests, the heart of the Moog Multimode Filter is the switchable Low- pass, Highpass and Bandpass filter that allows Moog’s signature self-oscilla- tion and extreme resonance in any of the three modes, bringing a new level of sophistication to Moog filter designs of the past. The Moog Filter is true stereo, with separate filters for the left and right chan- nels. The dual filters share the same controls. The only time the left and right filters diverge is when Filter Spacing or LFO Offset are not zero. The non-linear modeling of Drive characteristics is extremely DSP-intensive. For this reason, Drive is not available on the SE version of UAD Moog Filter. In UAD Moog Filter SE, the parameter is named Gain instead of Drive, and is a straight (non-modeled) input gain control. The range of Drive/Gain is 0 to +40 dB of gain. Drive/Gain affects both the wet and dry signals (the control is heard when Mix is zero and/or when Bypass is engaged). This gain range closely mimics the external input section of the Minimoog. The Envelope controls (Envelope knob, Smooth/Fast switch) closely mimic the controls of the MF-101 Moogerfooger. However, UA has broadened the sonic palette with a negative range allowing unique negative envelope effects. The cutoff frequency of UAD Moog Filter can be modulated by the amplitude of the signal coming into the plug-in. This function is typically called an “en- velope follower” or “auto wah” because the cutoff frequency “follows” the signal input level. The amount and speed of the envelope response can be ad- justed. The envelope knob determines how much the filter cutoff frequency is affected by the signal input level. Positive and negative values are possible. Positive values increase the filter cutoff as the input amplitude increases (the filter opens as the signal gets louder). Negative values decrease the filter cutoff as input amplitude increases (the filter closes as the signal gets louder). The greater the value (either positive or negative), the greater the amount of filter modulation (the cutoff frequency range is increased with greater values). Robin Schneider's review (This content has been automatically translated from French)" A filter or distortion? Both!" Hello, it was time to talk about one of my favorite plugins AU! The Moog Filter plugin is automatically installed with all the UAD plugins and can be tried free for 15 days each time a purchase is made on the AU store. Available in VST, Audio Units and RTAS, all 64-bit compatible now. The PDF manual is detailed albeit English. Must make an effort! On the other hand, anyone already fiddled a synth (hardware or software) or EQ or tremolo can quickly use the main functions of the machine. Only the "Mooger foogger" is more difficult to use. I use it on a mac with two Quad UAD2 DSP cards, a DUO PCIe and a quad in the Apollo. According to the sheet "body chart" on the Universal Audio site, Duo card can collect 12 mono or stereo instances of the plugin. A version of "SE" which simulates the filter without the input stage to open 56 instances. Practice when we do not want the filter without distortion for a cleaner sound. This is a "greedy" plugin in the image of all the plugins Universal Audio out for two years now. This is due to further stages of amplification and the input / output simulation. Here is the distortion circuits Moog is simulated and not only get a very credible moog grain filter, but also to make it a multi-use distortion if the filter is cut (I will detail it all in hour). It's been a year that I use on all my mixes, and sometimes taking over the apollo. I originally bought at a promo "create your bundle" or more you buy plug plus overall discount is important. As this plugin is part of the "middle range" ($ 200), it was worth it to take the time to get 40% discount on 4 plugins. So I took "bonus" story to have a filter often difficult to achieve with virtual synth like those reaktor character. This plugin has become my favorite distortion immediately. I put on all the sources that need to be put forward without sound "fuzz" or guitar pedal, or cheap digital distortion. The nature of this distortion is really unique, especially when it is not abused. It puts forward the source while maintaining the initial energy (where a compressor will soften any) and adds just enough harmonics to give a living presence and sound across the spectrum. Once fully inserted, you get a really dirty sound but can work very well on lead synth or electric guitars because the filter can remove the treble too. My basic setting cut filter, drive to output 4 and 6, try, you'll see. On percussion other than the bass drum, drive 4.5, and 6 out mode filter cut down to 50/100 Hz with a little resonance (1-4) to get his "in your face". Brilliant on a snare drum samplée (BFD2) to an acoustic drum we must treat the upstream source with a gate for example. Also works on a slightly hoarse voice. Story to tell, the LFO is very well supplied with waveforms sine, triangle, square, tooth saw upward or downward, and finally the random mode. A dry / wet can make the balance between the filtered sound and original sound. Attention, the dry / wet does not affect the distortion. In short: one distortion or distortion + filter. The only function that I use is the little Mooger fooger that allows the filter to keep the amplitude of the input signal. It is difficult to adjust and not very useful outside of the 70's funk funkadelic. Sound "self whah" which is only effective on a sound with a fairly high dynamic we obtain (avoid compressing moog before then). It is still important to have this feature which is really characteristic of Moog. Anyway, for me this plugin is part of the "must have" of the AU store. If you have any questions, do not hesitate to contact me MP. Finally, do not forget that UA offers a full 15 day demo renewable every purchase on their shop, it would be a shame not to enjoy it.